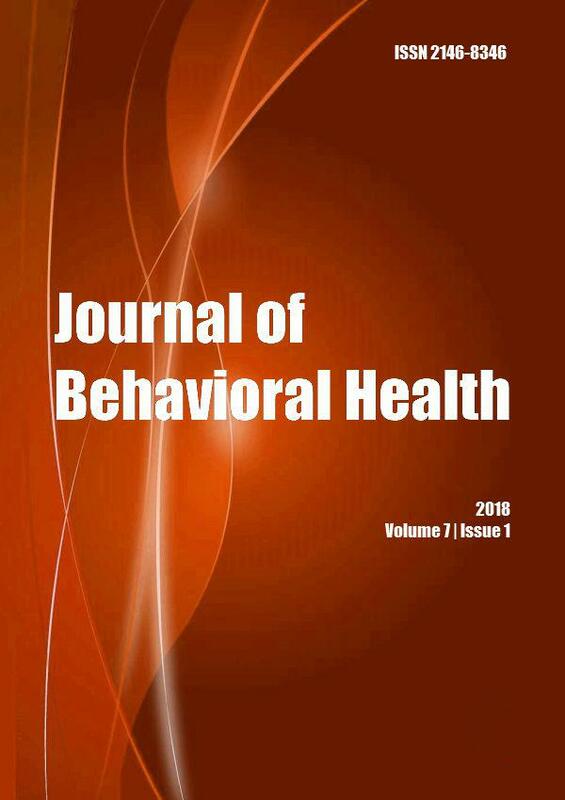 The Journal of Behavioral Health publishes original articles, reviews, commentaries, case series, case reports and correspondence on all aspects of practice, education, policy, and research in behavioral health and beheavioral medicine. Manuscripts are accepted for consideration with the understanding that they have been submitted solely to Journal of behavioral health and that they have not been previously published, either in whole or in part. The Journal of Behavioral Health is a fully peer-reviewed Journal. The editors reserve the right to make editorial changes in all matter published in the journal and cannot enter into correspondence about papers not accepted for publication. Copyright of all material is held by the The Journal of Behavioral Health. The editors, editorial board, sponsoring organizations, and publisher do not accept responsibility for the statements expressed by authors in their contributions. Authors and reviewers are advised that The Journal of Behavioral Health complies with the CONSORT (Consolidated Standards of Reporting Trials) statement (revised), found at http://www.consort-statement.org in its consideration of manuscripts reporting randomized clinical trials (RCTs). On the CONSORT website, you can click directly to the checklist, which should guide the preparation of the manuscript and the flow diagram, (to be included as a figure in the manuscript). In addition, The Journal of Behavioral Health requires that manuscripts reporting RCTs include the following information: date of approval of an institutional review board, sources of funding for the trial, and the trial registry number (if applicable). Manuscripts should be formatted for a 210 mm x 297 mm page with 25 mm margins on all four sides. Times New Roman 12-point is recommended for text, tables and figures. All text should be written in the third person and double-spaced flush left; avoid using tabs. Assemble sections in the following order: title page, abstract, text, acknowledgments, references, list of titles for all figures (typed on 1 page), tables, and figures. Number pages consecutively, beginning with the title page. The manuscript should contain NO automatic formatting (except page numbers in the upper right corner of each page). The Title Page should include the title (concise but informative, using no symbols, no CAPS except first letter of the title and not exceeding 80 characters in length) but no author name(s) or other descriptive information in order to keep blindness. An Abstract of 250-300 words should be included with each article, beginning on a separate page. Abstracts for research manuscripts may be prepared in a structured format, using background, methods, results, and conclusions. Text should begin on a separate page and follow these word-count parameters: 2700-3000 for research articles and 4000 for review articles. The number of figures and tables should be in proportion to the amount of text. All research manuscripts must include (in both abstract and methods section) the year in which the data were collected and when the sudy/analysis was conducted. Names or any other information that possibly identify authors must not be included in the text section for blindness. It sould be added line numbers to document. References follow the style of Index Medicus and should be identified by number in the order in which they are mentioned in the text; references that apply only to tables and figures should be numbered in sequence where the text first refers to the table or figure. If subsequent reference is made to a citation, the original reference number should be used again. Titles of journals must be abbreviated according to Index Medicus style, which can be found at http://www.ncbi.nlm.nih.gov/entrez/query.fcgi?db=journals. Information from manuscripts submitted but not accepted should be cited in the text as unpublished observations (in parentheses). National Bioethics Advisory Commission (NBAC). 2001. Ethical and Policy Issues in International Research: Clinical Trials in Developing Countries. Bethesada, MD. http://www.georgetown.edu/research/nrcbl/nbac/clinical/Vol1.pdf [Acces date: January 12, 2008]. Tables should use Times New Roman, each on a separate page; vertical and horizontal rules (lines) should not be used within the body of tables. Use arabic numerals to identify tables, and limit table heading to no more than 15 words. Footnotes in tables should be lettered (lower case a, b, c) except for statistical notes, which should be noted with an asterisk (*, **, ***). All abbreviations used in a table must be expanded in a legend under the table. The Journal of Behavioral Health accepts manuscripts electronically through the Internet-based program. Access to send manuscript page is gained through http://www.ejmanager.com/my/jbh/​.